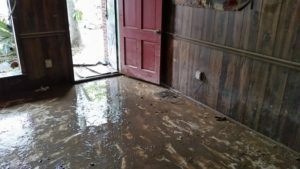 The #LAFlood of 2016 was truly unprecedented, so I wanted to sit down and share some my thoughts and my pictures. Cities in Louisiana that survived dozens of named storms found themselves suddenly flooding as a couple feet of rain fell within the span of just a couple of days. We received more rain the weekend the flood started than what Los Angeles gets in three years. Over a hundred thousand people saw their homes flood, but only a fraction of a fraction actually lost their lives. This was largely due to the independent efforts of local citizens (The Cajun Navy) dropping their fishing boats into dangerous flood waters to pluck people off of roofs, out of attics, or from the front of stores and churches to drop them off onto the nearest piece of dry land where hopefully someone in a vehicle capable of managing high water could take them to the nearest impromptu shelter. No one saw this coming and the local authorities did the best they could, but just weren’t in a position to respond. So, some of those once safe shelters started to take water. The Oschner hospital on O’Neal began to flood and had to evacuate patients that had already evacuated to it. For a time, the Amite River flowed over the top of Interstate 12 for at least a few days. Here’s a picture of Bayou Fountain. It’s a waterway that runs through Baton Rouge along Highland Road from LSU to Bayou Manchac. 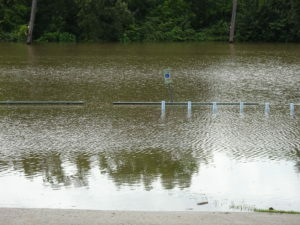 Normally, it stays at a level of a few feet to maybe half a dozen feet behind the treeline in the picture. 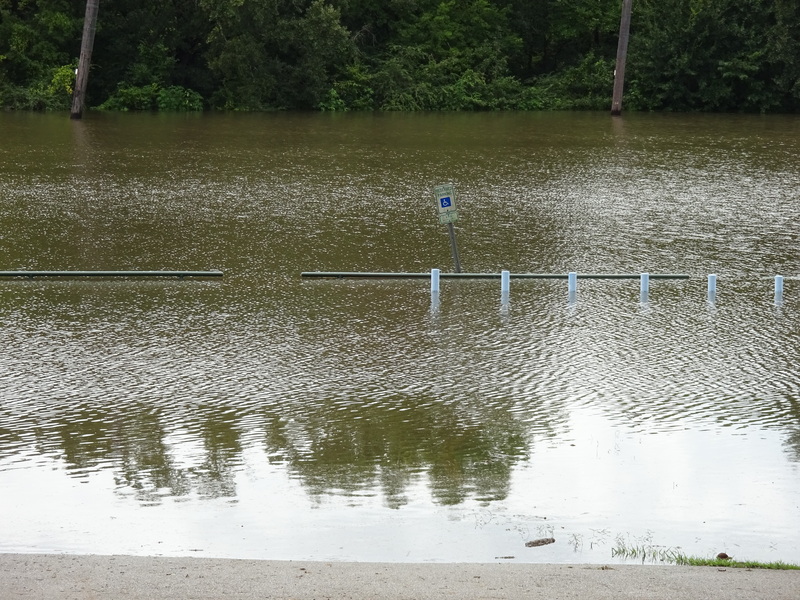 During past weather events like Katrina, Gustav, Andrew, and certain severe fronts, the bayou has flooded like you see, covering basically three softballs fields, an archery range, and a parking lot. Keep in mind that this bayou runs through Baton Rouge and the dwellings and businesses built near it have seen it flood like this, but not taken on water before. 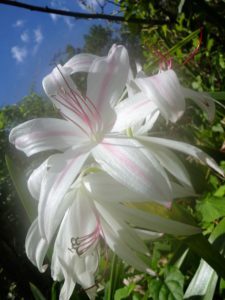 I took this picture and the next the Sunday after the rain. The water level got a couple of feet higher, as the bayou began to flow backward, no longer able to empty into Bayou Manchac, which was bloated by the Amite River. That green guard rail is about two and a half feet in height and the handicap parking sign is pretty standard, to give you some perspective. I standing on a hill maybe a thousand feet from the tree line to take the picture. The water came in and it is still going out. People are cleaning up now. And this is where the nastiest, hardest part of the recovery process comes in. The areas that flooded are basically swamp and wetlands or right next to them. If something can grow, it will grow, especially mold. And with humidity hanging around 90% on a daily basis this time of year, drying anything out is a serious challenge. Aware of this, people began gutting their homes as soon as they were able, dumping water-logged furniture and drywall onto the curb. Volunteers from local companies and churches to those from outside the state have been operating in organized units to clear out strangers’ homes. It’s one of those emergency gray areas where the usual rules of ownership don’t necessarily apply. 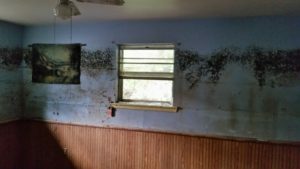 It would not be safe to leave random houses alone to breed copious amounts of toxic mold, swarms of mosquitoes, and deadly bacteria. 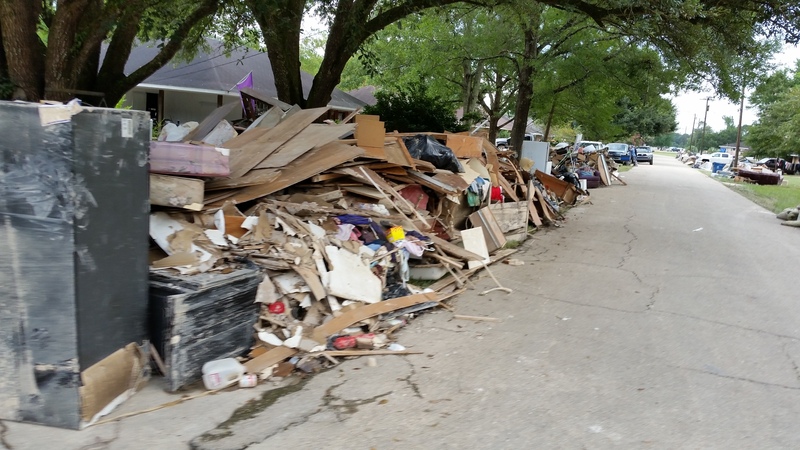 Neighborhoods in Louisiana now have new levees made of trash lining streets. 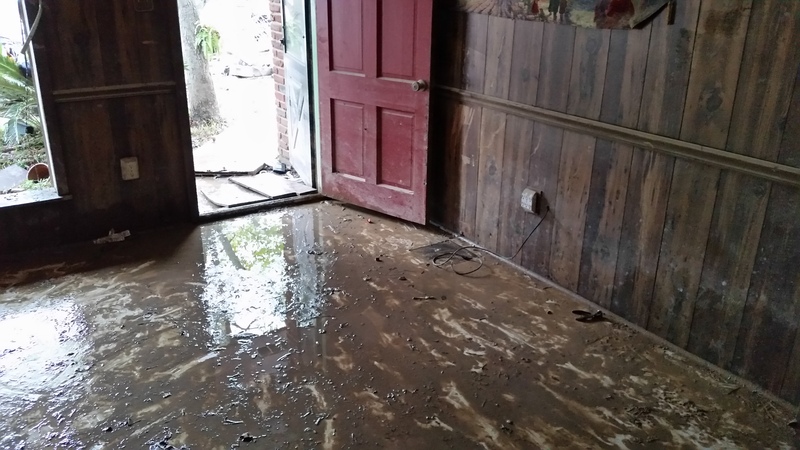 Not only did the flood water bring in a lot of silt and mud, it also brought in sewage and who knows what else. What none of you will ever know by just seeing pictures of the damage or watching videos of it is just how bad everything smells. It’s like a wet dog, rolled in manure and fresh mud with a tinge of sour meat. I’ve heard horror stories from friends and coworkers about losing their homes or having to evacuate through filthy flood water and dangerous currents with pet carriers and children onto fishing boats in the middle of the night or the lost and abandoned pets sitting in cages in shelters dying from the heat and the stress. The local rental car companies are out of cars to rent and people have taken to renting moving vans and trucks just to get around for the cleanup or to transport supplies. A lot of people who took a hit from this didn’t have flood insurance or even the necessary car insurance, because they didn’t need to have it. This was a 500-year event, if not even rarer. FEMA may help them, but it won’t be much help and the help will come with a price. The ones that were insured aren’t certain that they will even rebuild after this. Over the coming months, there will like be a boom of stripped-down homes for sale in Baton Rouge, Denham Springs, Walker, and other towns. In the meantime, the cleanup continues because it must, even as it seems to rain every day. But as I’ve posted on social media, beautiful things grow out of mud and water.